I'm back from my holiday. I've been away in Scotland, but this is the first photo I'm sharing on my blog from my time there. I made a deliberate decision to only share photos after I returned because I knew I wasn't going to have great internet access and I also wanted to concentrate on enjoying a break from spending large amounts of time in front of my computer. 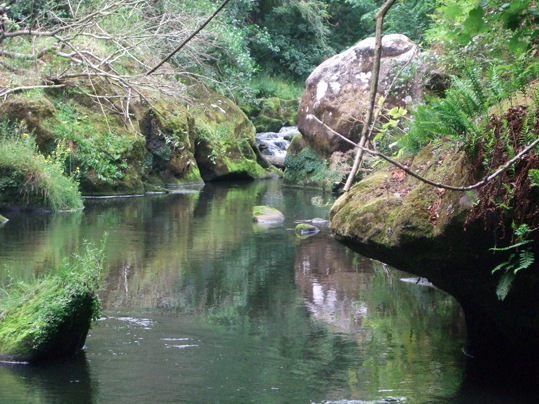 This is a picture of the River North Esk at Roslin Glen. It is an absolutely beautiful place to go for a walk and to have a picnic. The site is below Rosslyn Chapel - which I will be blogging about soon. Ahh, Rosslyn Chapel, a place about which a lot is written and many tales are told, except one save in passing. Rosslyn Chapel is a perfect example of a boondoggle spend project which got out of hand. It was started by a feudal lord who was getting on in years, and felt his immortal soul could do with a spot of polish. What better than dedicating a place of worship to erase a little spiritual dirt? What then happened seems to be that a poor old chap was ruthlessly exploited by the Stonemasons Guild, who proceeded to drain that lord's coffers dry. It all came to a grinding halt when the poor old fool died. His son, not burdened by a guilty conscience and rather more alive to the costs of the project, called an immediate halt and there it all stopped for many years. If you walk around the Rosslyn Chapel site, the planned building footings can be seen in the ground, and what is there now is but one arm of a very mighty building. The chapel was only "finished" in the Victorian period, by roughly walling off the open end of the unfinished chapel, and calling the work done to that point the finished article. Rosslyn Chapel is therefore not a mystical gateway, nor a Freemasons' masterwork. It might have been intended to be, but it was never actually finished at the time of building; what is there is less than 25% of the planned chapel. Very valid points Dan. I'll be blogging about my visit to Rosslyn Chapel later in the week. I really like the chapel, but its story isn't entirely a happy one I agree.